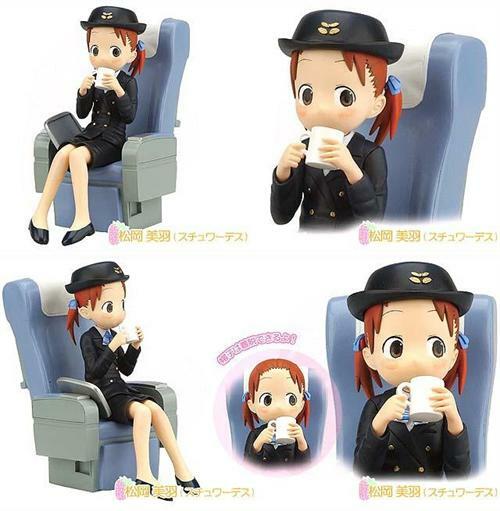 «©NCSX» Konami releases a limited edition Miu Matsuoka figure where the little rascal dons a stewardess uniform and relaxes on an airliner seat. Her prim uniform makes Miu appear very professional (although we know she's not) and her hair is tucked underneath a tasteful cap. Blue braids keep the rest of Miu's hair carefully tied together. Normally very excitable, Miu steps down the adrenaline and chills out while enjoying a beverage. She appears to be on her break and a serving tray sits alongside her on the seat. Miu's knees knock together and she grips a mug with both hands. We're guessing cocoa with a splash of vodka swishes around inside. The figure is being released under the Konami Figure Collection label and measures 15cm tall. The figure and the airline seat are both constructed of PVC and ABS plastic. This document is ©NCSX 2006, 2010. All rights reserved. No reproduction in whole or in part of this document may be made without express written consent of National Console Support, Inc.